I love creating Disney cupcakes. Everything from copycat recipes of the Disney cupcakes in the Disney Parks to finding ways to theme them to the latest Disney movies. I have rounded up my favorite Easy Disney Cupcakes in my collection to share with you here in one spot. These Easy Disney Cupcakes do not take serious pastry skill to create. I am your typical mom who has no baking skills whatsoever. I just enjoy creating treats that my family enjoys for movie nights and birthday parties. All of my Easy Disney Cupcakes pretty much start with using your favorite boxed cake mix. I am all for semi-homemade. Check out these Disney Cupcakes below to spark ideas for your own Easy Disney Cupcakes. These cupcakes are perfect for any Vanellope von Schweetz from Wreck-It Ralph fan. Easy to create with some simple red vines and sugar gems. These are a copycat recipe from the famous Be Our Guest Restaurant in Walt Disney World. A chocolate favorite! 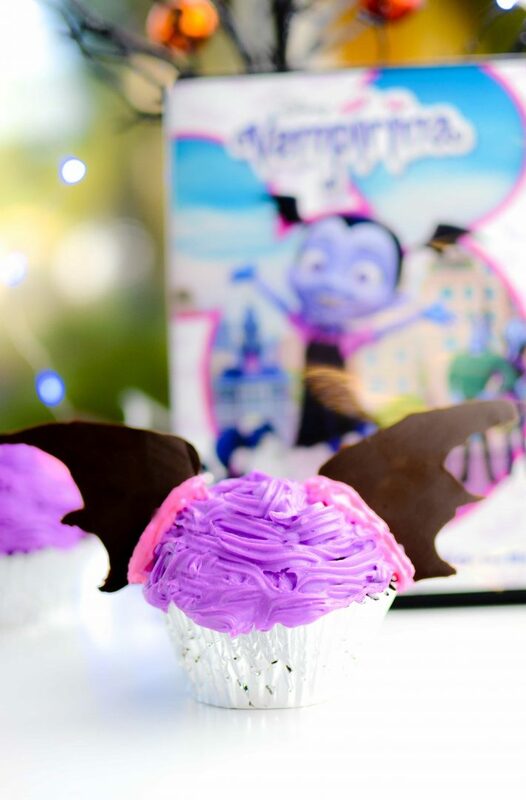 If you love Vampirina from Disney Junior, you will adore these cupcakes. They are a lot simpler to create than you think. Especially with my free printable to guide you. Marvel fans unite! These Black Panther Cupcakes are great for any Black Panther themed birthday party or simply just because. Have a Fancy Nancy fan in the home? These are perfect for them! Fancy Nancy has come to life on Disney Junior and these cupcakes are exactly like her. Bright, fun, and Magnifique. Each of these Easy Disney Cupcakes took me a quiet evening to make. Like I said before, I am all about semi-homemade. I love baking and creating things that look fun and whimsical but I also understand that we all are not master bakers or have the time to aspire to be. I hope these have helped you to create your own Disney Cupcakes, no matter what the movie or Disney Parks locations might inspire you.